Have I told you how much I love the new specialty Designer Series Paper called Share What You Love? You'll be seeing more cards using this paper over the coming weeks. There are 4 sheets of each of 6 double-sided designs in the pack making a total of 24 sheets of 12" x 12" paper. All of the designs are gorgeous, and 4 have a translucent, pearlised finish, to celebrate the 30th anniversary of Stampin' Up! Here's a card I made in a recent card class I went to, where we made a recessed panel card. I stamped the sentiment and floral images from the Love What You Do stamp set. I actually stamped the floral trio on a separate scrap of Whisper White cardstock and fussy cut them out, layering them onto the card front using Dimensionals. 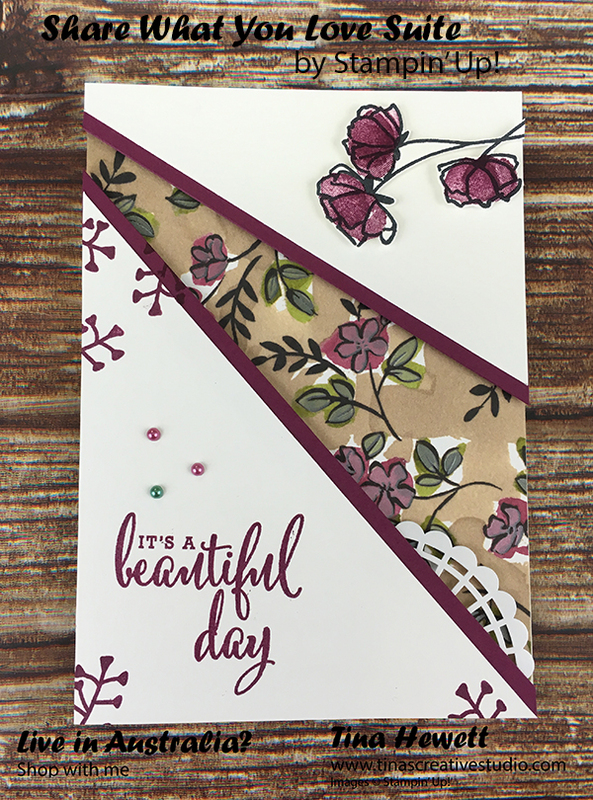 The strips along the edge of the raised panels are Rich Razzleberry, which coordinates beautifully with the patterned paper. This is an easy card to make. Just cover a card front with patterned paper, cut a piece of cardstock to the same size as the card front and cut a wedge out of it. The two pieces you have left are then raised above the patterned paper. I used fun foam to raise the panels so that they are flat for mailing if necessary. The extras I added are a few of the Share What You Love Artisan Pearls, and a piece of a Pearlised Doily. I've listed the supplies used to make this card below, just click on the images to be taken to my online shop.